This product can be used pre-workout, throughout your whole workout, or just through the day to keep protein synthesis high. This is the cleanest purest amino acid product on the market Period! We will not hide behind a "blend" of aminos. We want everyone to see the level of quality and purity we put into this product. 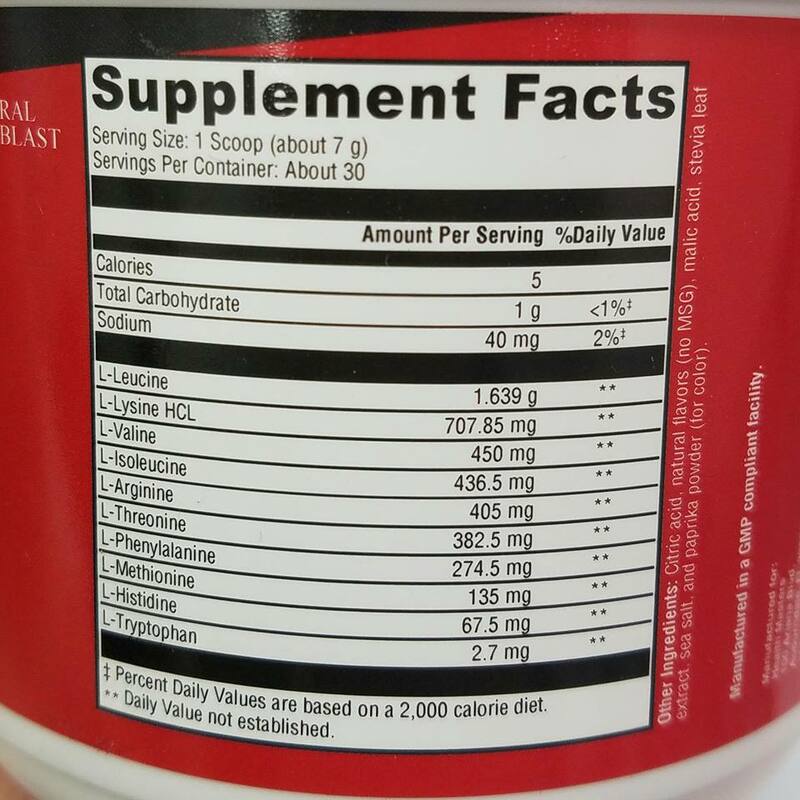 Including Over 1.63 GRAMS of Pure L-Leucine in just 1 scoop. Muscle Blast represents a breakthrough in the use of amino acids for muscle protein synthesis. Over 20 human trials have been conducted to arrive at this specific, patent-pending combination of amino acids in the most effective, anabolic ratios. 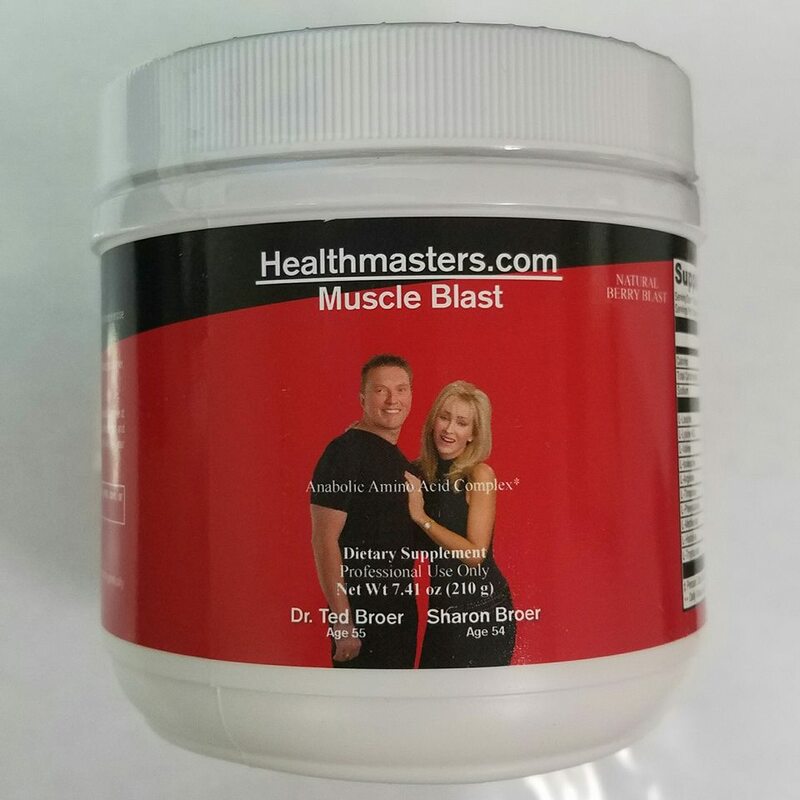 Whether you want to support muscle strength and function or prevent muscle loss associated with inactivity or aging, Muscle Blast provides the right amino acids in the right ratios to help you meet your goals and stay healthy. Each container provides 30 scoops in a Natural Fruit Punch flavor. Seventeen years of research have resulted in this particular blend of the nine essential amino acids (EAAs)— including the branched-chain amino acids (BCAA) leucine, isoleucine, and valine—plus arginine, proportioned in the most optimal ratios for muscle anabolism [1-7]. The formula is designed for both young and elderly individuals who are seeking to stimulate muscle protein synthesis, hasten muscle recovery, and promote muscle strength and function. The effectiveness of EAA intake is amplified by ingestion before exercise because of the increased delivery of amino acids to the muscles [3,8]. In fact, results from acute studies have shown that exercise and EAA intake have additive effects on muscle protein synthesis . Furthermore, BCAAs, have been demonstrated to hasten post-exercise muscle recovery. For example, leucine-enriched EAA supplementation (total EAA was 10 g of which 1.85 g were leucine) prolonged the anabolic response and the sensitivity of skeletal muscle to AAs . Beginning in your 40s, there is a natural and gradual decline in muscle mass (catabolism), strength, and function as a result of the innate metabolic changes and the more sedentary lifestyle that accompany aging. Studies using EAA supplementation at doses of 6.7 to 45 g/d in advanced age, bed rest, and recovery from surgery have demonstrated important benefits. These benefits include stimulation of muscle protein synthesis, enhancements in muscle strength, and improvements in functional parameters of the studied muscles [5-9]. Protein supplements are often used to help ward off muscle-related losses in the elderly. According to Ferrando et al, “Increasing protein intake to 1.4 g/kg/d in the elderly with EAA supplementation indicates the potential for preserving muscle function” . For example, someone weighing 100 lbs. would need to consume about 45 grams of protein each day, while someone who is 200 lbs. would need to eat about 91 grams of protein each day. Furthermore, the elderly tend to use protein supplements as calorie substitutes and reduce their food intake [4,9]. In these cases, it becomes critical that the AA supplement be low-calorie, so as not to influence satiety, and highly efficient to confer maximum benefits to skeletal muscle . A high proportion of leucine is another factor that is required for optimal stimulation of muscle protein synthesis in the elderly . Additionally, there is evidence that the presence of carbohydrates in a nutritional supplement for the elderly is not beneficial and may actually impair muscle anabolism. Muscle Blast is a highly efficient blend of EAAs plus arginine that provides zero carbohydrates [4,7]. Citric acid, natural flavors (no MSG), malic acid, stevia leaf extract, sea salt, and paprika powder (for color).